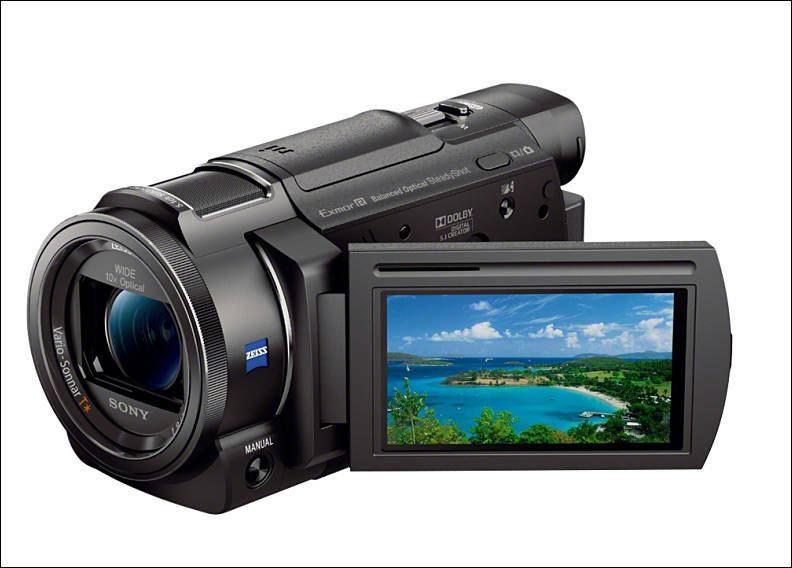 The new FDR-AX33 model is Sony’s first 4K camcorder feature the acclaimed Balanced Optical SteadyShot (B.O.SS) image stabilization technology, which ensures that 4K video output is smooth, stable and blur-free at focal lengths ranging from wide-angle to extended telescopic zoom. This is particularly useful during 4K shooting, where stabilization is often a challenge due to the immense amount of data in each frame. 4K video can be recorded by the camera in the advanced XAVC S video format at an extremely high bit rate of 100 Mbps, allowing each frame to be packed with extraordinary detail and with minimal distortion thanks to high speed sensor readout . For the more advanced videographers, the new 4K camcorder includes a customizable manual ring and manual button that can be assigned to key functions like zoom, focus and exposure adjustments etc. The camera is equipped with a high-performance electronic viewfinder approximately three times the resolution of previous models, and a beautiful 3.0” Wide Xtra Fine LCD WhiteMagic™ display that performs admirably in all shooting environments including bright sunlight. Post shooting, 4K video content shot with the FDR-AX33 camcorder can be played back directly on a compatible 4K television through the supplied HDMI cable, or in super-sampled Full HD is connected to an HDTV. The camcorder can also ‘trim’ 4K images from video frames, enlarging a chosen portion of the frame to fill the screen with Full HD quality. In this mode, trimming size can be changed with zoom lever or on-screen icon 3. Standard on all 2015 Handycam models, Highlight Movie Maker automatically creates great-looking short movie clips accompanied by transition effects and background music with no editing needed. Handycam picks and assembles your best shots like smile and tagged points to create short, social media friendly mp4 format videos to share with friends and family. Through use of PlayMemories Home™ software, shooters can customize the length of their highlight video to match the length of pre-installed or personally selected background music. Also offered across most models in the range, Multi Camera Control utilizes Wi-Fi to allow a ‘master’ Handycam to control a variety of Sony’s Wi-Fi connected cameras including key functions like Start/Stop recording, zoom and other standard settings. When the ‘master’ Handycam is paired with Sony Action Cam or QX ‘Lens Style’ cameras5, it can control up to 5 devices simultaneously. Footage from all of the connected cameras can be easily combined post-shooting through use of PlayMemories Home. whoa...there's rumors of 2 more models. I'd bet that their web team screwed up the specs . If so good news . Still the ax33 is a pany killer imho. What kind of rumors you mean? I see their action cam that is 4K, and this is all. ...yep looks like they shot the fat lady already and that's it ! And the confusion was there's 2 action cameras in that rumor, but where's the fdr-axp35 ? Only 10x optical and dark on the long end, but a very nice 4K camcorder in a compact housing. Also will force the prices down, hopefully. Too bad they did not use the 1" sensor from the AX100, but the AX100 is not that much more expensive. It would be nice to have a smaller, lighter version, though. Yep, this one is gonna replace my CX730s, for sure! Wi-fi remote of 5 units? I wonder if one could do a multi-cam setup and remote control each one separately on the same phone. Zoom, focus and exposure. Nifty! Both Sony and Panasonic seems to be using same sensor - 18.9Mp, BSI, with only central portion used for shooting 4K. I suspected that's what that P in the AXP35 stood for, but I was just too tired to look. So the trade off for the tiny sensor is that incredible moving lens stabilization system. So for the price of a cheap gimbal, you can get one with a 4k camcorder. That's actually kinda of cool. I bet next year, sony cuts the size even more ! Well, let me get strait to the point. It never happened. This camera is NOT aimed for the serious shooter. My attempt to shoot with it “a real life story” ended up after couple of hours. The reason is simple. You can not be fully creative and control every (basic) aspect of the camera functions. Instead, the camera will “control you”. There is absolutely no way of dialling Iris, shutter and gain to manual position at the same time. Just when you got one right, the other will automatically “jump” into “auto mode”. This one needs other tester to check, as I am not sure that they understood that they are doing here. Sony strategy...always...release a pro followup version after the clunky consumer release. I'd guess midyear. I remember when the Canon HV20 came out we had to use tricks to dial in the gain, like starting it up pointed at a light to lock in zero gain. Gets annoying really fast (but that was a great cam). Vitaliy, be sure I understand what I am doing when reviewing a camera! Well, past reviews on Cinema5d had serious issues. I also did not said anything about you being wrong, just that other people later need to check it, as camera must not behave such in manual mode. Yet, some previous Sony consumer cameras did similar things. I also think best idea is talk to Sony about this and get official answers (or promises to fix). I've been reading their reviews for years and the only problem I ever saw was the a5100 DR mixup. In fact I've lost interest on some cameras just based on Johnnie's eye for moire ! Although I assume the firmware was prototype as well, so there might be some hope esp if sony reads some negative feedback. Not having full manual control makes the camera not interesting to many shooters who might use it as a carryaround. But as Dave said, we've all used methods to trick functions before. But these days , since it's all firmware, there's no excuse. For me personally, I still want it even smallerrrr...and fully control-able ! I would like a small, lightweight ax100. I doubt that you can make it much smaller, as it is just physics. I'd rather see larger version with optional XLR ala X70, 4K p60, HEVC, and also with balanced stabilizer.